I never realised before how easy it is to transport common plants from one locality to another without intending it. It’s easy to sneer at the fools who released the grey squirrel or marvel at the stupidity of the cane toad infestation in Australia until discovering that with the pots of small trees and herbs we brought over intentionally to furnish our new gardens and hedgerows have carried seeds of other less welcome plants which I would have hesitated before importing to this new environment. In the gravel by the tree nursery there is a plant of Chenopodium “Magentaspreen” which we bought as an exotic vegetable seed several years ago for the allotment at Newport Pagnell and which has vigorously self seeded itself ever since. It is a pretty plant with vivid magenta young growth, hence the name, edible young leaves and a magnificent habit reaching 6 ft or more in a healthy plant but just like its cousins the fat hen and goosefoot almost impossible to eradicate. I don’t think it cross fertilises with the native species but I’m reluctant to make the experiment without a bit more certainty than that. I’ve also discovered a plant of buddleia, that butterfly beloved weed of railways and abandoned car parks. I can’t be certain that the seed for this came over with us, but there are no other plants of it within miles and it is suspiciously close to the potted trees. Normally I enjoy the serendipity of discovering these tiny seedlings and make good use of the free propagation but now I’m wondering if it may be taking things too far too fast while we are still learning about what we already have. 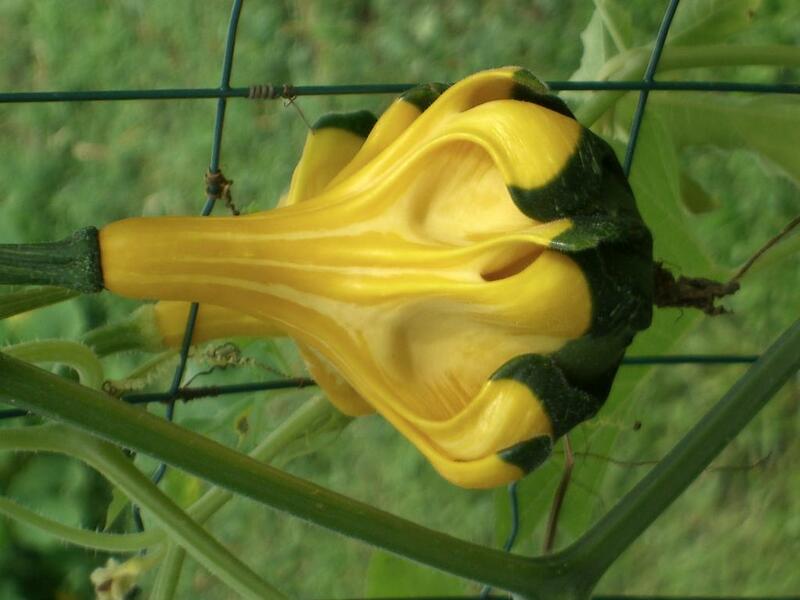 The picture is of a gourd at an interesting little garden open to the public at Isigny-sur-Mer. Les Jardins de la Decouverte are near a sewage works but have an interesting selection of gourds, pumpkins and exotic plants from around the world. The garden also has a therapeutic function for the adults with difficulties who work there. Well worth visiting in August and September if you’re in the area.